Your vernal pools are lovely, and they make me glad that I don't live in a cold climate. As always Laura, your Serenity and tranquil ways are so soothing and positive. You are such a Shining Star in a Dank and troubled world! When I read this I can SMELL the seasonal reawakening. Thank You for playing and gracing the Friday Funfest with your creative brilliance. What gorgeous winter scenes. Love the reflections. How pretty. They should be happy to sleep in a bit. Beautiful rendering. I like everything about this photo. 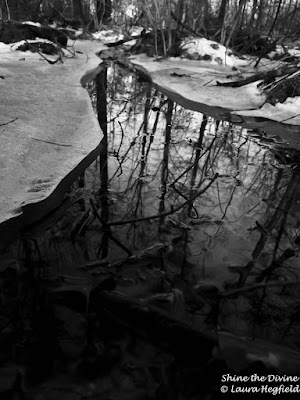 Especially the way the meandering stream and reflections are framed... Great in B&W. The two photos displaying tree reflections in vernal pools - are amazing. I like the rhymes conveying the message that despite the melting of ice, winter is still here. Beautiful photos, especially I like the second. Wspaniałe zdjęcia odbić drzew w wodzie, między lodem . Cudne. Pozdrawiam. 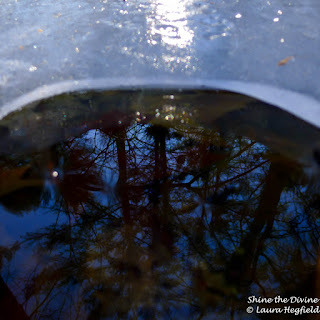 *** For great shots of reflections of trees in the water between the ice. Wonderful. Yours. Lovely! You've packed a whole load of beauty in this post. Wonderful shots, the second is superb! Hi there - 'vernal' is not a term you come across everyday. Like the way spring flowers are called a vernal flush! Wow - so beautiful and pure! Winter has really got us in its grip over here - at last! Oh these are So Pretty! Thanks for the sweet comment you left on my Granddaughters picture post! Beautiful reflection in color and in black and white. These are beautiful reflection photos--the kind that you can gaze at for a long time and not get tired of tooking at.